Now that the major mechanical work is done I need to spend a little time making brackets and fitting accessories on the drive train. Nothing here is rocket science but when you're dealing with a 59 year old engine some things are going to have to me fabricated. The mechanical fan I'm using is a Mopar 7 blade unit that has been proven to draw more air than just about any other Mopar fan. I believe it was standard equipment on "A" body air-conditioned cars about 30 years ago. The good thing is that it's a simple bolt on. When I mount the radiator I'll make the determination if a spacer will be needed to move it a little closer to the fins but that's easy to do. If one is needed it will only be a couple inches or less. My plan is to run an aluminum radiator with this fan open with no shroud. This should be adiquate but I do have plan "B" which will add a 16" Spal pusher fan in front of the radiator (mounted up high) to provide additional air flow. Back in the day (early '60's) a shroud would not have been used and that is the way I'll be running this one. Plan "B" will only be used if necessary and only time and actual experience with this setup will tell if the additional fan is needed. This is a good example of why you should never throw a mount away. About 20 years ago when I was working on the 454 for my pro-street car I picked up a laser cut mount for a Chevy alternator. Didn't use it on that car but just stuck it in my spare parts bin. That mount is what I'm using here. It did require some fabrication to adapt it to the Hemi but that was pretty much a straight forward process. There just isn't room to mount it low between the frame rails where I would rather see it but sometimes you just have to compromise for the sake of progress....so its mounted up high. The next item on the list was the clutch slave cylinder mount and adjusting rod fabrication. I'm using a hydraulic clutch setup from an early 60's Chevy truck, which by the way is exactly the same one used on the American Graffiti Coupe. The stock setup actually installed the slave cylinder on the passenger's side but in this application it is mounted on the driver's side. All that was required here was to fabricate the mounting bracket. The adjusting rod is a cut down 7" grade 5 bolt with a coupling and jam nut used for adjustment. The end of the coupling was filled with weld and then ground round to comfortably fit in the clutch arm and at the other end the head of the bolt was cut off and the end rounded to fit correctly in the receptacle on the slave cylinder piston. The spring keeps tension on the whole setup to keep it together. This is pretty much exactly how this setup would have been done back in the day. 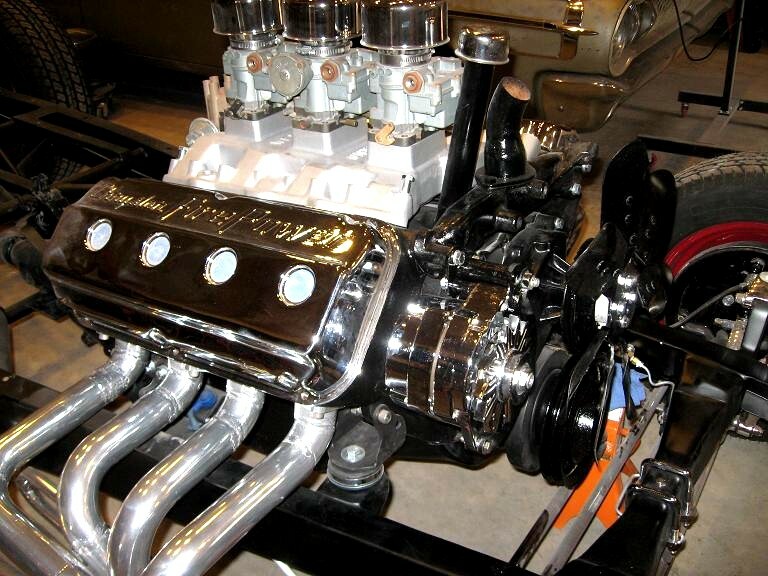 Finally an easy mod to adapt a small block Mopar electronic distributor to your early hemi. HotHeads sells this simple kit (sleeve and two rolled pins) that allows you to cut the shaft on the distributor and lengthen it 3/8" so it properly engages the intermediate shaft. This mod takes all of 30 minutes to do but makes all the difference in the world. Fits like it was made for this application and best of all it fully engages the intermediate shaft. An electronic distributor really beats the daylights out of an old single or dual point unit. Not only does it provide a hotter spark but there are less moving parts to mess with. Next on the list I need to make a couple mufflers to fit in the 3 1/2" turnouts. Now that's going to be an interesting project. After thinking about it for quite a while I decided to change the location of the alternator in order to clean up the top end of the engine. With the alternator mounted high on the engine it detracts from the tri-power setup and just kind of clutters things up too much for a nice visual appearance. In order to move the alternator I had to change the pulleys from the HotHeads bright aluminum units to something with less back spacing that would move the belt further away from the front of the engine. This was necessary because there just wasn't enough room to fit the alternator in front of one of the cylinder banks based on the belt location using the HotHeads pulleys. To solve this problem I used a couple stock Mopar 400 big block pulleys I had sitting on an engine waiting to be torn down for use on another project. The water pump pully for the big block has much less set back spacing than the HH unit and moves the belt out almost 2" further which results in a little over 1/4" clearance between the cylinder head and the back of the alternator. The crank pulley from the 400 was another problem. It was a four groove unit which was WAY too ugly to use in its stock configuration. After checking to see how much offset was needed to align with the water pump pulley, it looked like the second groove would work perfectly. Because this crank pulley was made in two pieces it was pretty easy to cut off the outer two grooves and the finished product works and aligns just fine. True I did give up the "bling" of the aluminum units, but I think it was worth it to clean up the top of the engine. I used the same bracket used for the upper mounting location but modified it slightly for a bit cleaner appearance. The actual mount was made from some scrap steel and is actually simpler than the one needed for mounting it in the upper location. The result is a clean installation that is easy to adjust. There are a couple other things that I'm not totally happy with when it comes to the "top" of the engine such as the oil filler tube and thermostat fitting angle but I'll deal with those at a later date.